Although thick hair looks healthy and attractive, thick-haired people face many challenges in keeping them that way. The biggest of them is taming flyaways, which is the key to styling thick hair and can take all day. 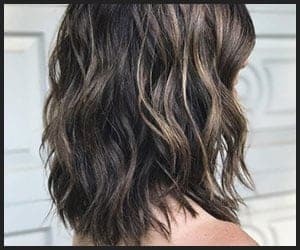 Apart from this, thick hair sheds a lot, tangles easily, is hard to curl, takes a long time to blow dry, frizzes when brushed or exposed to humidity, needs lots of conditioners, and becomes puffy when trimmed. People with thick hair often complain that they find their hair in all places because they shed so much hair every day. They also struggle with very knotty hair on a regular basis and have the daunting task of detangling their hair each morning. Thick hair is incredibly difficult to curl. To add to this, the curls go flat within a few hours. Blow drying is a dreaded chore for thick-haired people because thick hair takes so long to dry. 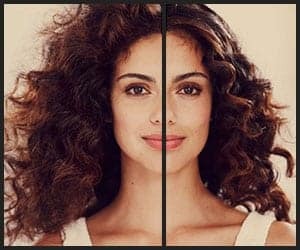 Humidity, haircuts, and brushing are disliked because they cause thick hair to frizz uncontrollably. Thick-haired people have to spend a lot on conditioners to keep their thick mane sufficiently moisturized. Hot rollers can help people with thick hair achieve well-defined and long-lasting curls and at the same time solve some of the problems mentioned above. Read on to know more. Thick hair takes a long time to style with a curling wand, flat iron or blow dryer. You have to hold up the device for a long time which can make your arms sore. On the other hand, hot rollers do not need any further handling once they have been rolled into your hair and until the curls have set in. When using a curling wand, flat iron or curling iron, thick hair often has to be exposed to a high temperature to alter its shape. Repeated use of these heat styling tools can damage your hair. 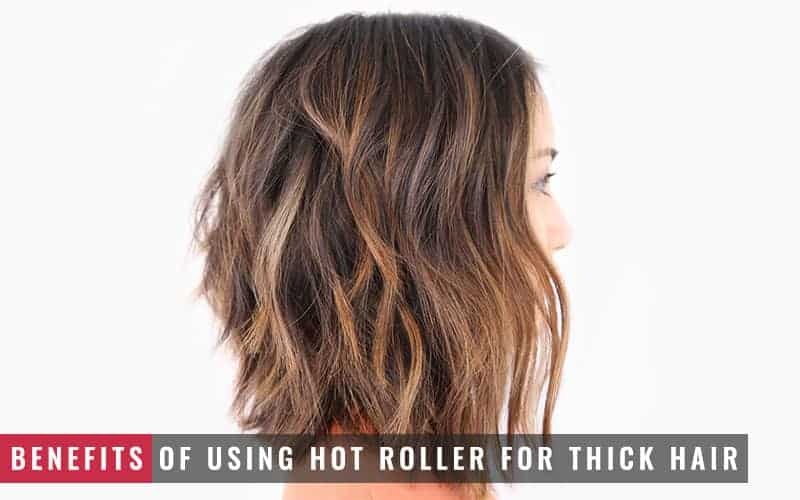 With hot rollers, you do not have to worry about damaging your attractively thick locks because hot rollers stop heating up beyond a certain temperature. The latest hot rollers are built with ceramic technology and ionic ports which emit infrared heat. This helps to fight frizz while styling your hair into elegant curls or waves and making it smooth and shiny. The same can be achieved with curling irons, straighteners, and blow dryers, but these methods are time-consuming and cause arm fatigue. Although different hairstyles can also be achieved with curling irons and curling wands, hot rollers provide greater scope for experimentation. Each roller set comes with rollers of different sizes allowing you to try out different curling styles on different occasions. Roller sizes range between 0.8 inches and 1.5 inches. Small size rollers are perfect for neat ringlets, medium size rollers are excellent for classic curls, and large size rollers are ideal for pretty waves. While most hot roller sets come with these three standard sizes of rollers, you will find some roller sets with an additional roller size: the jumbo size. Jumbo size rollers, which measure 1.75 inches, can be used to achieve more natural-looking waves in long and thick hair. With curling wands and curling irons, you have to wait until you finish styling your thick locks (which can take a while) to do your other chores. This is where hot rollers have an advantage over these other heat styling tools. 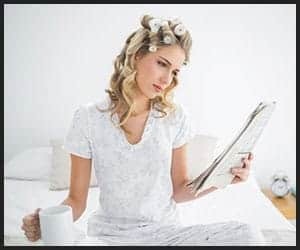 You can write a shopping list, put dirty laundry in the washing machine, check your email, water your indoor plants, press your clothes, or simply enjoy a cup of coffee while waiting for the rollers to cool down and the curls to set in. Curling wands and curling irons are limited in their ability to curl thick hair from the root till the end. These hair curling appliances cannot be held too close to the scalp due to the danger of burning it. 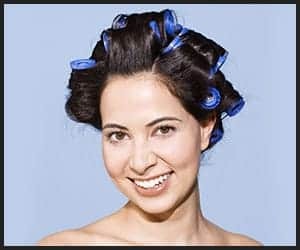 There is no such risk involved in using hot rollers. Moreover, standard hot rollers have sufficient surface area and strength to wrap the entire strand of hair around each roller. This makes hot rollers perfect for styling long and thick hair into splendid curls, waves or ringlets. 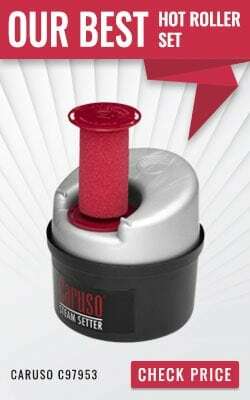 Hot rollers are designed to allow your hair to slide out easily from them without becoming tangled. So, you do not need to worry about negotiating difficult knots in your thick mane. You will find hot rollers that are infused with argan oil which is renowned for its hydrating properties. They condition the hair making it smooth and silky thus meeting the exceptional conditioner needs of thick hair. People with thick hair shed a lot of hair every day. There is nothing even the best set of hot rollers can do about this. Thick hair takes hours to blow dry and all day to air dry. For this reason, it is best to wash thick hair at least 24 hours before styling it with hot rollers which cannot be used on wet hair. To prevent thick hair from becoming frizzy, it is advisable to apply an anti-frizz mousse and a smoothing cream before styling thick hair. Moreover, thick-haired people should use a wider comb or hairbrush so their hair does not become puffy. A palm-sized quantity of conditioner must also be applied to thick hair twice a week to maintain smooth locks.